Setting aside the political wisdom or otherwise of establishing a ‘Women for Gillard’ campaign modelled on a US Presidential campaign strategy, today’s mishandling of the pre-launch story by Labor is yet another example of the party just not getting the basics of effective communication. More often than not, communication roles in politicians’ offices and party headquarters are filled by former journalists. The rationale for this is that former journalists are knowledgable about what best constitutes news in the media’s eyes and have a network of contacts within news organisations that can be exploited to get stories placed and covered in a favourable light. This is where the trouble begins. Former journalists in communications roles don’t/can’t see beyond the media when it comes to communicating with the public. Communications specialists know there are myriad ways and will choose the communications tool that best delivers the message to their target audiences – sometimes this will be the media, but many times it will not. And in this new brave world of disintegrating news media, it is even more important to know and use the most effective way of delivering a message to target audiences. Nevertheless, placement of the “Women for Gillard’ story in Sydney and Melbourne’s most read newspapers must be a pretty good way of getting a message across, no? Well, actually, no. The other thing that differentiates (former) journalists and communications people is that the former are tactical, focussed on immediacy and how to get the best story up, while the latter take a strategic approach where everything is tied together to achieve a longer term objective. For a tactical person, getting a favourable news story up is an ends in itself. For a strategic person, the same news story is but one tile in a mosaic, which might be pretty on its own but ultimately adds to an overall bigger picture that is incomparably more attractive. In a strategic approach to communications, nothing happens on its own. Complementary activities create a sense of completeness and momentum. A press statement here is echoed by a speech over there and a opinion piece somewhere else. Twitter and Facebook alert and direct to other versions of the same message. Eyes are directed to websites where more information is provided. Youtube videos and podcasts cater to other communication preferences. Without these other pieces to help it tell the story, the narrative, one prominent news story on its own will be nothing more than a pretty tile. And so we have today’s pre-launch announcement of ‘Women for Gillard’, complemented by a gaping hole of nothingness. No Twitter account, Facebook page or website towards which interested readers could be directed. Nada. Only a vacuum to be filled by those who find the suggestion that the PM is a champion of women galling in light of her government’s policies and her personal support of Faceless Feeney over the female candidate in Batman. 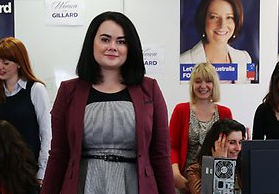 Undoubtedly, the official launch of ‘Women for Gillard’ on Tuesday will have all the attendant pieces; by then there will be a Twitter account to follow and a Facebook page to like etc etc. But the next 48 hours is an opportunity lost; the battleground has effectively been declared but then left vacant for the opponent to occupy. When the time comes to record the whys and hows of the Gillard Labor Government’s tragic self-destruction, #PRfail will be high on the list of its flaws. Nice piece. I don’t understand how JG thinks it doesn’t look hypocritical to back Feeney’s bid in Batman over a female candidate who lives in the electorate. It just looks really bad. Labor have been parachuting mates into seats for too long and has destroyed the grass roots membership and, dare I say, the credibility of the candidates. I ended up on this site because I read a small reference to a Women for Gillard lunch and thought I’d like to know more about it and would even join up immediately if it was possible online. But the best I got with more than one google search was your blog, NO web site!!!!!! I am a senior exec in an international media agency based outside of Australia and work with PR agencies all the time. I CANNOT believe that there is no landing age for this even if something simple. Would have taken no time and very little money to create in time for the prelaunch. terrible missed op. disappointing. PR that looks like PR is failed PR. I don’t know how her PR people manage it, but whatever they put out looks like spin. Abbott just mouths some meaningless piece of nothing and it still looks more sincere than her PR can manage. That’s appalling. Leaving aside how she got there, I wanted her to succeed when she became PM, because of the depressing alternative. I still like her for many reasons but she disappoints me. She’s headed some of the most desirable programs to be introduced into Australian society. When she talks off the cuff she comes across very well. She tore Abbott to shreds in parliament over misogyny. At the same time she’s backed personally some of the most retrograde steps imaginable. So why she sticks to the prepared spindoctored scripts for her PR and allows such a WATCH THIS SPACE silliness as you describe to dominate her image beggars my comprehension. She should be the ALP’s greatest asset. Even a disgracefully hostile commercial press isn’t totally to blame. I blame her advisors, and I blame her for letting them get away with this unrelenting folly. Denis, wish all you want for a competent JG to succeed as PM, she is useless and she had hired useless people around her. the media are not to blame, they report her antics as they see it and tell me, how does one report positive uselessness? Her mysogeny speech was shameful, is this how we use the privilege of parliament, to make uninformed and biased statements towards a male, this is showing objectivity and leadership to the Australian people? She is an asset to the labor party, the problem is Denis, Labor is irrelevant in today’s times and when you have a group of unions that only capture 14% of the working population as members, tell me Denis, who is out touch with reality and why the hell do the unions have so much say in our lives with such a small base? That’s why she sticks to scripted rubbish, because she is useless as the rest of the party around her. I don’t know Dragonista, all political parties are pretty crap at social media aren’t they? Anyway, perhaps the PR decision was not to launch a full-on women for Gillard onslaught which could backfire badly in the press climate, not to mention the unpredictability of social media campaigns. If it was inept, or just modest, I’m glad that Gillard has the guts to stand by something she was forced into taking on. I don’t care if she isn’t the patron saint of all women and children and puppies and kittens everywhere – she’s a politician, not Mother Theresa . She will have my eternal gratitude and admiration for the sheer personal and political bravery of taking on the hitherto unmentionable gender issue in such a powerful way. I totally agree with Denis Wright above, except I would go further and suggest that what appears to be inept PR is rather that the press is so heavily weighted against any gesture by Gilllard that we really have no way of judging. Love your insights as always Dragonista. Well put. Interesting to see your deconstruction of the communication strategy Drag0nista – cheers!